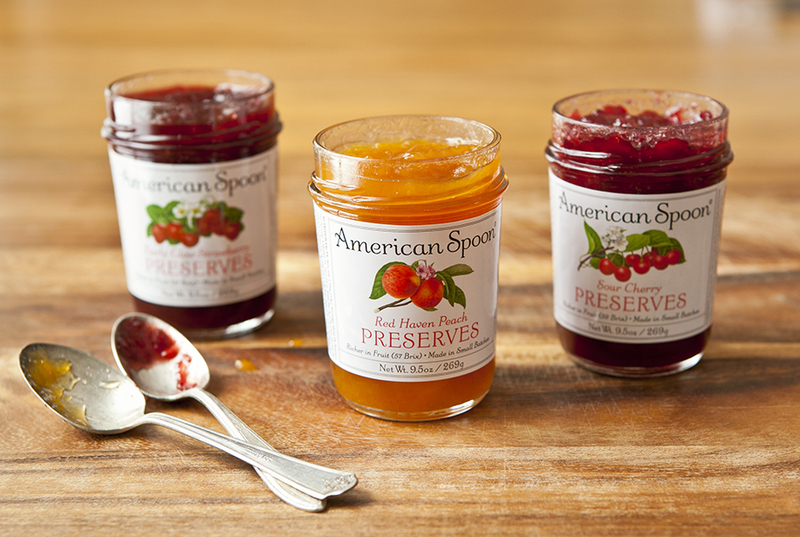 Posted on January 15, 2014 by Matthew J.
American Spoon has been making delicious fruit preserves since 1982, born of a partnership between Justin Rashid in Michigan and Chef Larry Forgione of An American Place and River Café in New York City. Mr. Rashid would forage wild mushroom, nuts and berries for Chef Forgione to use in his dishes, a role that soon transitioned into developing fantastic and flavorful preserves. The company name comes from the initial line of strawberry preserves, which were better served by spoon than knife. Since then, American Spoon has continued to thrive, with an ever-expanding line of spoon fruit, salsas, marinades and other delectables. Mr. Rashid and his business keep their focus squarely on the quality of the fruit, sourced from the farms and wilds of northern Michigan. You can taste their attention and care in every spoonful. Justin was kind enough to speak to us about American Spoon’s past, present and future. What inspired you to found American Spoon? Justin Rashid:I had been sending Chef Forgione lots of fresh wild blackberries and wild blueberries and it got to be more than he could use. Larry flew into Pellston airport one late summer day in 1980 and I drove him down to Traverse City. He was enjoying the scenery and asked, “What are all these trees we’ve been passing, growing in perfect rows?” “Well,” I said, “those are fruit trees—cherry orchards mostly.” I found myself explaining that we were on a peninsula, and the effect of the proximity of Lake Michigan to the west creates one of the most superb micro-climates for fruit cultivation in the entire world. Cherries, apples, pears, apricots, peaches and plums all thrived here. And the very next thing he asked was, “Can you make preserves—you know, jam?” He said The River Café did a great weekend brunch business and he’d been looking for excellent American fruit preserves and there just weren’t any. 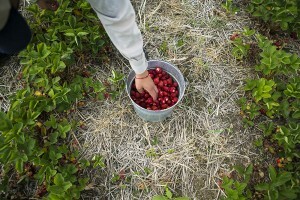 Well, we were both 28 and completely ignorant of the realities of commercial food processing, and so of course I said, “Sure—you send me a recipe, and I’ll find the best fruits and we’ll make jam.” And that’s how we set out to make the best preserved fruits in America from Michigan fruits. When Larry got back to New York he dictated a recipe for Strawberry Preserves that I scribbled onto the back of a bag. By the next June, using $20,000 in borrowed funds from each of us, I had moved two copper kettles with long wooden paddles and a manual filling machine into the rented basement of Kilwin’s Candy Store on Howard Street in Petoskey. Any funny stories from those early days? We spent our first summer, 1982, cooking preserves in the basement of Kilwin’s. The fragrances of simmering Early Glow Strawberries, Raspberries and Red Haven Peaches wafted out of a vent onto the sidewalk and down the street on the Lake Michigan breezes. But because we were invisible down there, pedestrians savored those vapors and turned directly into Jesperson’s Restaurant, where pie sales tripled that summer, while we didn’t sell a single jar. By the next summer we had moved our kitchen into our flagship store location on Lake Street. People could actually see where those delicious smells were coming from (and then taste and buy our preserves as well). What attracted you to northern Michigan initially? I spent all my childhood summers from the age of five here and I could never get it out of my head. I guess you might say that it had become the inner landscape that I returned to in memory, until, at the age of 25, I came back to stay. What do you think sets your business apart? 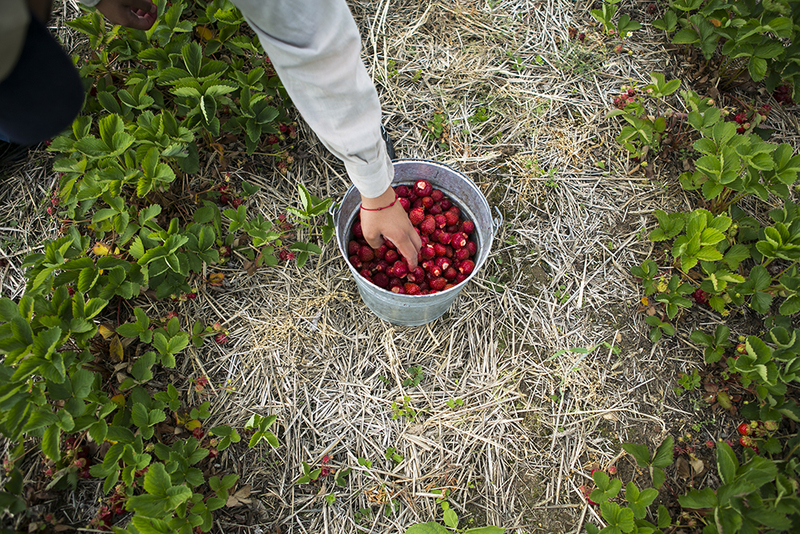 How deeply we are rooted in our particular place: The Northern Fruitlands of Michigan. I don’t believe that American Spoon could have happened anywhere else. We are devoted to capturing and preserving our region’s fruits in authentically delicious products that cannot be found anywhere else. So we go to great lengths that most companies simply cannot or will not go to in order to accomplish this. We have at least a hundred local foragers who bring wild blackberries, wild elderberries and thimbleberries to our kitchen. We devote many weeks of our summer to hand-pitting apricots, paring pears and hand peeling peaches. I don’t believe there is another company that hand processes local fruits at the scale that we do. We believe that we earn the right to exist by preserving as much true flavor as we possibly can in every jar. How much of your produce comes from foraging in the wild? Five to ten thousand pounds, depending on the year. What sort of relationship do you have with the growers and farmers who supply American Spoon? They are long term relationships of great mutual respect and interdependence that must endure through good times and bad, through bumper crops and disasters. They wouldn’t last if they were simply based on price; they have to be built on trust. So we happily pay much more than processor prices because we know we are obtaining something of unique value that has been grown with a real commitment to a demanding, but rewarding lifestyle. Could you describe the process of preserving fresh fruit? It varies widely for every fruit, but we adhere to some general principles. First we find a wonderful fruit with flavor, texture and aroma worth preserving (we can’t preserve what isn’t already there and nothing improves in the kettle). Then we work to find the best way to capture the aesthetic characteristics that make that particular fruit so wonderful. How ripe should this fruit be? Should some of the peel be left on? How large should the chunks or slices of fruit be? If they are berries, should they be left whole? Does the fruit require additional pectin to gel? Does the fruit require acidification and if so, what is the best acidifier to use? Lemon juice, lime juice, orange juice or another fruit? Does this fruit stand on its own or should we pair it with a contrasting or complementary fruit or spice? And, perhaps most critically: what is the ideal sweetness level and fruit-to-sugar ratio and how much reduction time in the kettle will achieve the best result? We are trying to capture as much authentic fruit flavor, texture, color and aroma in the jar as is possible. Sometimes this requires maceration and multiple steps or stages, and at other times it can be a remarkably fast process. How much experimentation goes into developing new products? Usually you have to invest quite a bit in order to achieve something special. I think our record is our Cherry Peach Salsa at forty three test batches. Our Culinary Director, Chef Chris Dettmer, spends most of his time in the test kitchen engaged in product development and has quite a remarkable streak of winners. We have gotten much better at this process over the years. Creating something new is a great deal of work, but it is the most enjoyable work we do. Do you have any upcoming items that you’re particularly excited about? In addition to a wonderful quince and a crabapple jelly, we are working on several new pickled vegetable products that are very promising. What is a good day at American Spoon? A day when the system of connections or relationships that have been developed over three decades, with our growers and foragers, our customers and our people here at American Spoon is alive with activity. On those days, you can feel that that new connections are being made, the work is fun and the future is bright. Wendell Berry, beginning with his book, The Unsettling of America, has long been a source of inspiration for me. Jerry Oleson, the local grocer who made his own pickles in his backroom and who started a buffalo herd here in the 1950’s in an attempt to save buffalo from extinction, was a friend and mentor. 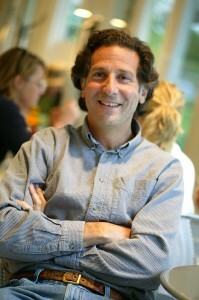 He didn’t separate his workday from his lifestyle, and his enthusiasm was contagious. I find that I am inspired by the stories of innovators, like Stanley Johnston who spent decades cross-pollinating fruit varieties here in Michigan from the 1920’s through the 1940’s and ended up developing the most delicious peach varieties in the world. He is also the person responsible for convincing Michigan farmers that they could grow cultivars of wild blueberries back in the 1920’s and 1930’s. Michigan now grows more cultivated blueberries than any other state. How was 2013 for American Spoon? It was a year of astounding abundance following a year of unprecedented scarcity. Having lots of beautiful fruit, especially the stone fruits like Red Haven Peaches, Harlayne Apricots, Damson Plums and Montmorency Cherries available again made a huge difference for us. Our biggest problem was that there were not enough hours in August and September to preserve it all. And we launched some wonderful new products that our customers love like Chili Jam and Valiant Grape Jelly. Our hopes for 2014 are to finally see a large enough yield from the small quince orchard that my friend, Gene Garth, is growing for us, to actually launch a new quince product! We are also hoping to have enough wild blueberries from local foragers following the Duck Lake fire in the Upper Peninsula to do something special with those as well. We will continue to work with a growing number of local farms to supply us with more chili peppers, heirloom varieties of tomatoes and other vegetables that will be incorporated into our conserves, relishes and salsas. You can find American Spoon’s Red Haven Peach Preserves in our Early Bird Breakfast Basket and customize any gift with a jar of their Early Glow Strawberry Preserves. Spoon not included.